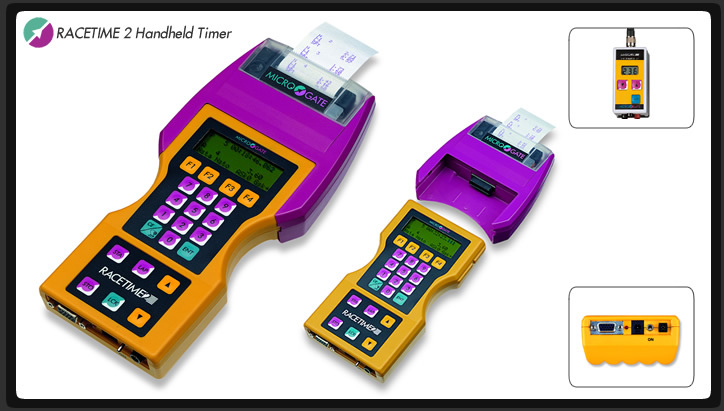 One of Microgate's biggest sellers is the RACETIME 2 handheld timer. Thanks to its small size, anatomic shape and intuitive menu-driven interface, learning how to use the device takes only a few minutes, yet the plethora of onboard programs and functionality of the device allow for a remarkable degree of flexibility. Because of its small size and power, the RACETIME 2 is ideal for training, where rapid setup and dismantling is important. This timer is what we recommend for use with our various self-contained Training Packs. Even a single athlete can time a training session completely automatically. All times are recorded, stored and printed without any manual intervention. The wide range of programs available, the ability to immediately print start lists and the rankings at the finish (on the detachable printer) and the ability to interface with PC's and scoreboards, make this device much more than your average portable timer! Oversize keys ensure that the timer’s functions can be accessed with maximum ease, even when wearing gloves. In combination with the LinkGate system, Racetime2 is able to receive coded Start, Intermediate and Finish impulses via radio with maximum reliability, freeing the operator from the need to be connected via cable with the photocell at the finish. The timer’s reliability, even in extreme weather conditions, is guaranteed by the broad operating temperature range and by ‘smart’ recharge management. The onboard batteries guarantee autonomy of over 12 hours, even at very low temperatures. Races such as alpine skiing, mountain bike, timed climbs, etc. Ability to manage an unlimited number of competitors on the course at any time. Recommended for the management of competitions such as cross-country skiing, marathons, cross-country cycling, etc. Countdown management, general-purpose timing, excellent for events requiring display of lap times. Timing of single and double phase competitions according to FEI rules; simple and immediate assignment of point and time penalties. Functions as a timebase for the transmission of data to PC in real time. Works as a versatile speed trap, and also features inputs for data such as snow and air temperature and air humidity. Designed to work with the OptoJump system. An excellent general-purpose timing application. Up to 3 athletes can take part simultaneously, each making up to 250 runsthat are automatically numbered by the chronometer. Immediate rankings can be produced in several formats with the puch of a button. Racetime2 is ideal for custom applications. Contact us for more information.